I’m in heaven! 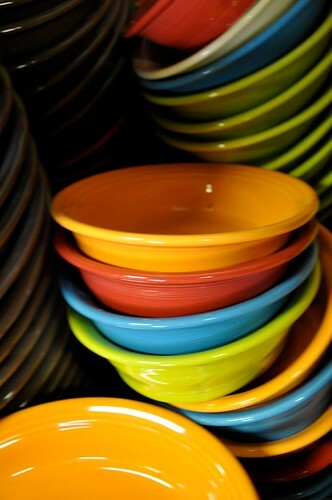 Fiestaware is probably one of the most iconic dinnerware patterns around, and it’s still made in the USA! You’ve probably seen it, or one of the other Homer Laughlin china patterns in your favorite vintage diner, restaurant or retro eating establishment. The factory tour was already full when we tried to make reservations, so I consoled myself by buying a deviled egg tray and a few other cheery pieces in the 2nds room. The colors go perfectly with the interior of the Hacienda! They also sell first quality Fiestaware at the outlet.